This book reports on the latest advances in the analysis of non-stationary signals, with special emphasis on cyclostationary systems. 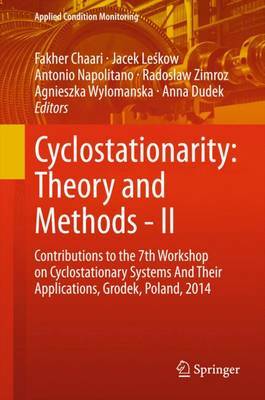 It includes cutting-edge contributions presented at the 7th Workshop on "Cyclostationary Systems and Their Applications," which was held in Grodek nad Dunajcem, Poland, in February 2014. The book covers both the theoretical properties of cyclostationary models and processes, including estimation problems for systems exhibiting cyclostationary properties, and several applications of cyclostationary systems, including case studies on gears and bearings, and methods for implementing cyclostationary processes for damage assessment in condition-based maintenance operations. It addresses the needs of students, researchers and professionals in the broad fields of engineering, mathematics and physics, with a special focus on those studying or working with nonstationary and/or cyclostationary processes.